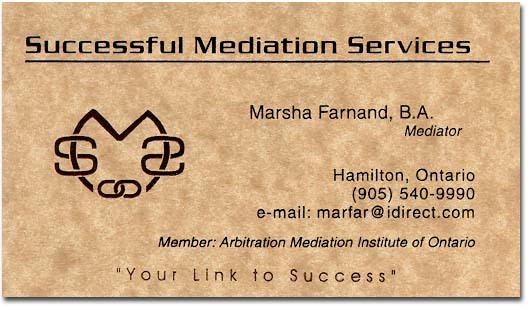 This is a scan of the finished business card for Successful Mediation Services. Two raised inks were used. The "SMS" logo and the motto along the bottom are in a dark brown (hard to see in this scan) and the rest of the text is in black. The printer we dealt with on this project was terrible and will never receive business from us again. The print quality was fine, but there were countless delays and the printing was overpriced. A good learning experience, though.